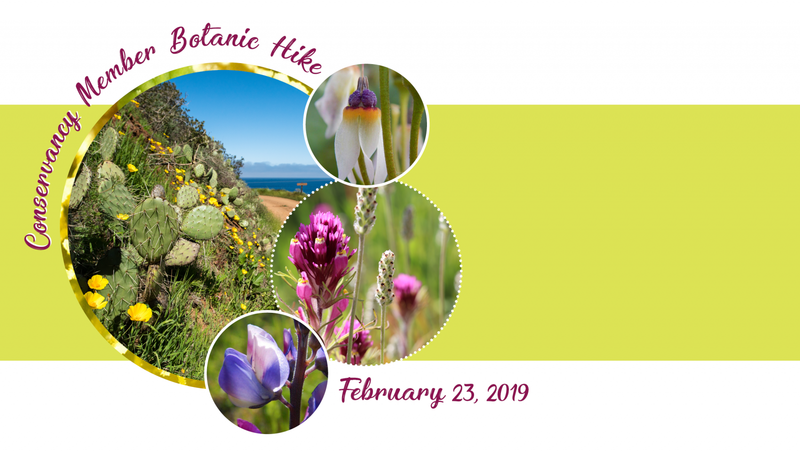 Experience Catalina Island's green landscape and blooming wildlands at the Conservancy Member Botanic Hike on February 23rd. Led by Conservancy Education Specialist, Hillary Holt, this California Spring hike at Eagles Nest Loop will showcase the Island's new growth and early flowering plants from the winter rains and much more. Enjoy this recreational opportunity to explore the Island's interior while engaging with fellow Conservancy members. On Island bus transportation to and from the start of the hike is included in the $20 member registration fee, as well as lunch and refreshments. Guests are welcome to join for the non-member rate of $30. Be sure to book your boat ride over to the Island after registering below. All participants will be greeted at the entry of the Conservancy's new Trailhead visitor center in Avalon at 9:30am, on Saturday, February 23rd where buses will depart for Eagles Next Loop Trail which is about a 45 minute drive with beautiful vistas. The hike will begin at 10:30am and conclude with a picnic lunch. Please register below while space is available. Be sure to book your boat to the Island before it sells out. If you're coming over just for the day, the Catalina Express departs at 6AM and 8:15AM from Long Beach. For the return you'll be back in Avalon by 2:30PM for the 3:50PM to Long Beach.